Painful attempts to make something that's really very simple. 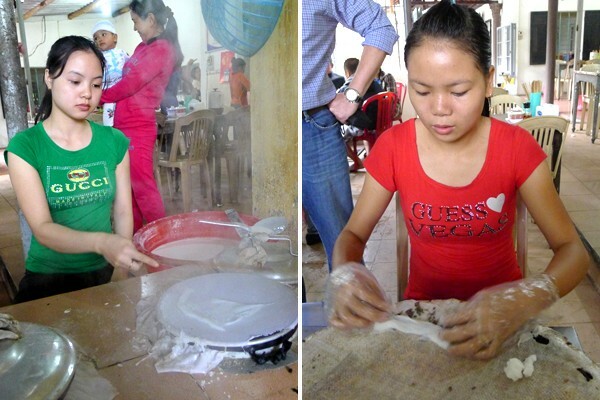 When Fathom co-founder Pavia Rosati went to Vietnam, she thought she could learn to cook simple street food. She was wrong. HUE, Vietnam – I just got back from an incredible, if incredibly brief, ten-day trip to Korea and Vietnam. I was thrilled to discover two new places — Seoul was dazzling and massive; Vietnam was beautiful and lush — but most of all, I was excited to eat. A key revelation of deliciousness was banh da tom (bánh đa tôm, if we want to be precise about it), a Vietnamese sesame rice cracker served alongside my friend Ashley's green papaya salad at lunch at La Residence, our chic hotel in Hue. The crackers were crispy and light and filled with black seasame seeds. They reminded me of papadum. Ashley offered me a taste; I ended up eating them all and ordering two more plates. "I must learn to make these," I announced. Cooking in a foreign country is one of my favorite things to do. Unfortunately, the kitchen at La Residence couldn't accommodate my banh da tom request on our tight schedule. But they came up with a better alternative. They arranged for me to go to a local restaurant to learn to make banh uot (bánh ướt, if we want to keep being precise about it), which translates as "wet cakes" and is essentially a crepe made with a batter of rice flour and water. The restaurant, after the breakfast crowd has cleared out. The final meal: banh cuon. Let me set the scene: You enter the restaurant by walking through a doorway on an unassuming residential street and into a courtyard. The restaurant is on the right; the family's home is in front of you. 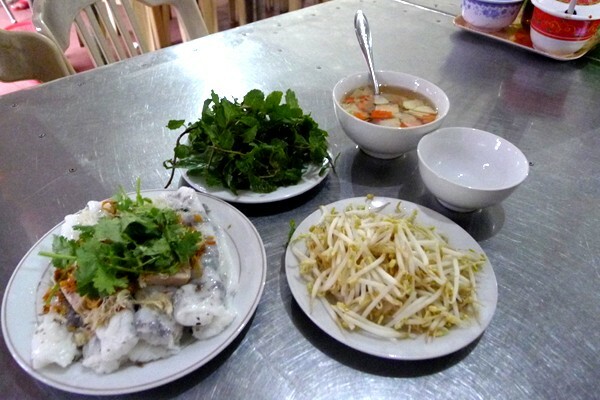 The place specializes in bánh cuốn, banh uot stuffed with mushrooms and pork and served with herbs and bean sprouts. There are a dozen tables set up with plastic chairs. This isn't a place that gets a lot of Westerners. 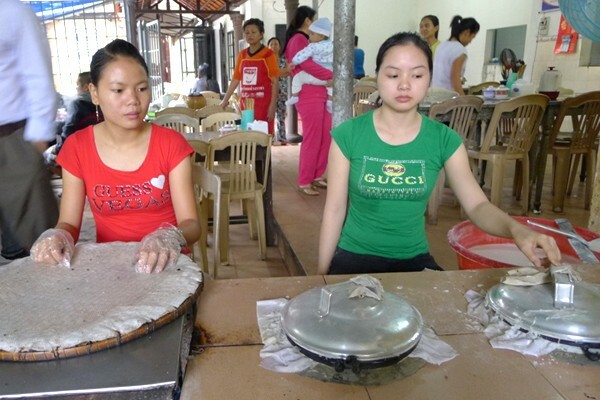 Two young girls are at work on the assembly line at the end of the dining room: One is making banh uot, two at a time, on round, cloth-covered grills. The other is stuffing and stacking them into a plastic container. They're wearing tight T-shirts with sparkly Guess and Gucci logos. They work fast, averaging one cake every ten seconds. The process looks simple enough: Pour batter onto griddle, spread evenly, wait a few seconds for it to form into a flat crepe-like cake, use a long and flat stick-like spatula to gently lift it off the grill, and finally place it onto a tray so the second girl can stuff it with mushrooms. Easy. 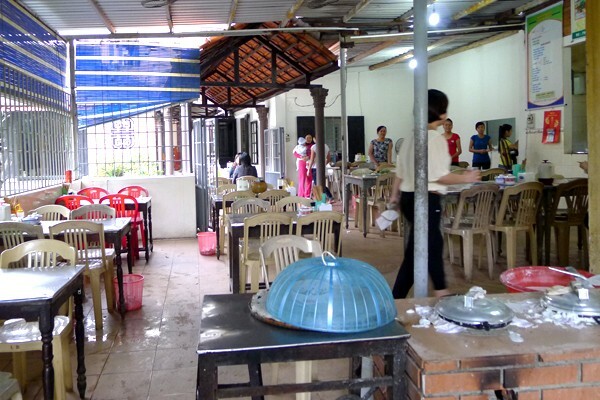 The banh uot setup at the end of the dining room. Banh uot in action. Step one: Make the wet cake on a grill. Step two: Stuff the cake with mushrooms. Let me just say that I'm a pretty confident cook. Roast pork for 50? Sounds good. Spaghetti for 20? Come on over. I'm not dazzling in the kitchen, but I'm very competent and coordinated. So I sat down, ready to go, a dozen people circled around me. Watch how good I am, I thought. Well, I have met my culinary match. It is a mixture of rice flour and water. I spilled everywhere. I couldn't spread the batter. When I did spread the batter, I couldn't lift the crepe without knotting it into a crumbled mess. The second girl was waiting for me to make one decent crepe she could unfurl and stuff; she kept waiting. I never delivered. This video details just how pathetic I was. After what felt like 15 humiliating minutes but was probably only three, I sat down for a plate of banh cuon. A good plate, not my garbage versions. And now how's this for irony? I didn't like it at all. It was gummy and chewy, not textures I particularly like. I ate one, smiling at the owner. I couldn't be rude, especially not after trashing her griddle. They were going to have to scrub that thing down. "It's delicious!" I lied. She couldn't understand my English. A few hours later while I was walking through some gorgeous Buddhist temples, someone pointed out that I had batter splattered all over my foot. Really. This was the cooking lesson that kept on giving. They couldn't stop laughing at me. As for the sesame crackers, well, I would have totally nailed those. Next time.